(1) There is no such thing as a Palestinian people: Indeed, as readers note, no such people existed through the centuries. Palestine (Arabic: "Filastin") as a political unit only came into use as a Zionist triumph when imposed by the British occupiers following the issuance of the Balfour Declaration in 1917. Palestinians (Arabic: "Filastiniyun") also came into use only in the twentieth century. Jerusalem never served as capital of a sovereign Muslim state. All true. But, starting in 1920, with the imposition of a geographical unit later to be called the British Mandate for Palestine, the Arabic-speaking Muslims of that territory understood they had to adopt the Palestinian identity. In 1948, when Jews abandoned the term Palestine in favor of Israel, the word Palestinian became exclusively Arab. With the foundation of the Palestine Liberation Organization in 1964, this identity acquired political expression. The Palestinian Authority in 1994 gave it official status. At this point, it is futile, even silly, to deny the existence of a distinct Palestinian Arab people. 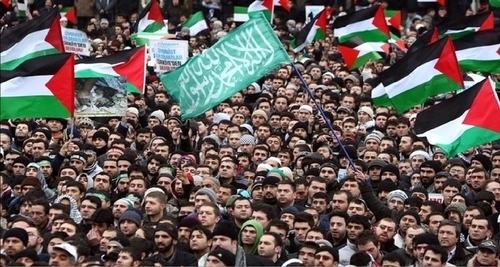 Palestinians in Gaza in February 2014 protesting against U.S Secretary of State John Kerry. That said, the Palestinian Arab identity that emerged so quickly from political necessity may not last forever; as I noted back in 1989, "the primacy of Palestinian nationalism could eventually come to an end, perhaps as quickly as it got started." (2) Muslim peoples never give up, always keep going in warfare, and so cannot be defeated: I addressed this in passing in the Commentary article: "Muslims have repeatedly given in to infidels through history when faced with a determined superior force, from Spain to the Balkans to Lebanon." To which, the reply comes that in these and other cases, Muslims did not entirely give up: Islamists dream of Al-Andalus, Turkey's Prime Minister Erdoğan has neo-Ottoman ambitions in the Balkans, and Lebanese Muslims successfully terminated the Christian-dominated state. Alhambra to return to Muslim rule? Again, all true. But the notion of retaking Spain is limited to the realm of fantasy, Erdoğan has no intention militarily to retake the Balkans, and Lebanon's Muslims exploited the designs on their country of a neighbor (Syria) to bring down the Maronites. Meanwhile, Sicily was lost to Christian rule in 1091 and no Muslims aspire to its reconquest. Comparing Muslims with Christians makes this point more clearly: If the above examples show an undying Muslim spirit, the same applies to Christian too (and, by extension, to everyone, e.g., the Chinese). The Kingdom of Spain claims Gibraltar, despite its being ceded in perpetuity to Great Britain in 1713, over 300 years ago. The government of Greece claimed parts of Anatolia after World War I that had been under Muslim rule for as long as 700 years. Benito Mussolini, the ruler of Italy, attempted to resurrect the Roman empire over 1,400 years after the demise of the western empire in 476 A.D.